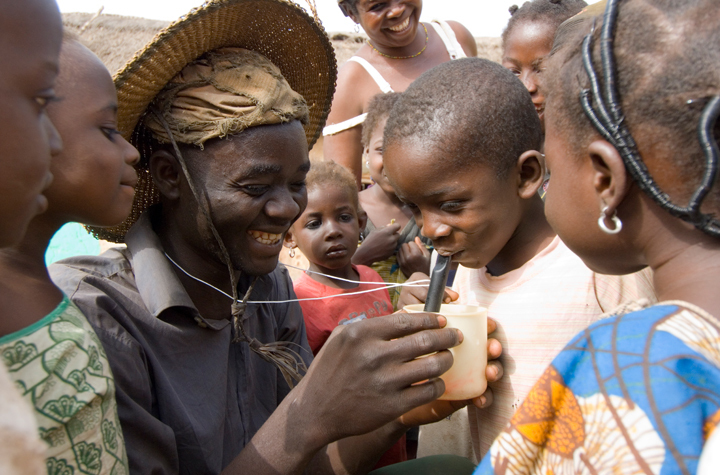 Nuru Aiblim, A Guinea worm health volunteer in Ghana, demonstrates to children how to use pipe filter when they go to the fields with their families. Pipe filters, individual filtration devices worn around the neck, work like a straw, allowing people to filter their water to avoid contracting Guinea worm disease while away from home. In May of 2010, with Carter Center support, Ghana reported its last case of Guinea worm disease and announced it had stopped disease transmission a year later. Credit: The Carter Center/L. Gubb, “PIPE FILTER DEMONSTRATION,” The Global Health Chronicles, accessed April 20, 2019, https://globalhealthchronicles.org/items/show/4922.